Imagine that you have a pressing style question. Or a not-so-pressing question that randomly comes up in conversation. Wouldn’t it be awesome to have access to a bonafide expert? 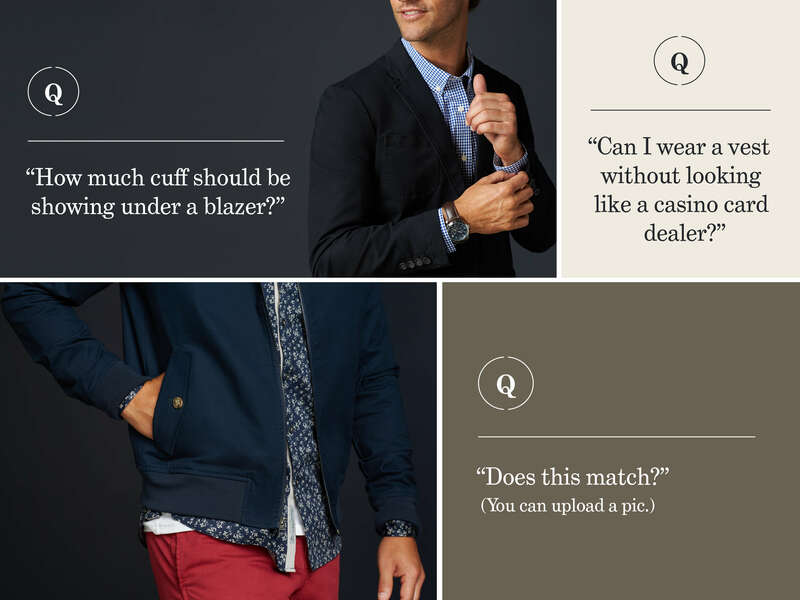 Meet Ask a Stylist: a fashion guru within arm’s reach (or however far away your cellphone is). It’s like a search engine with a real person on the other side. It’s the future. Want some ideas of what to ask? Glad you asked. Third day straight in the same _______ (check all that apply: color, pattern, pair of jeans, shoes, type of shirt). Our Stylists are bootcamp trained to pull you out of a rut. Need workwear recommendations? Tell us your office dress code. Want advice on mixing & matching clothes? Oh, that’s right down our alley. Vacations. Weddings. High school reunions. Hot dates. We all have occasions that need just the right look. We’re here to help. Tell a Stylist what’s happening—or ask if something’s appropriate to wear (photos encouraged)—and you’ll get personalized advice in a flash. So you tried something on from your Fix. Fits great. Looks good. But you’re not sure if it matches what you own. Sounds like the perfect time to Ask a Stylist. Upload photos of your clothes, then let your Stylist advise you on how to work it. Ok. So you’re trying something new… being adventurous like Lewis & Clark on the Oregon Trail. Good for you. But then you suddenly travel into uncharted territory, and you’re not sure if your new shirt matches a pair of pants. What to do? Ask a Stylist how to (cure dysentery) pull an outfit together with your prized item. Breaking the rules is for criminals. No, just kidding. But there are occasions when following the rules is important (even if it’s just important to your date). Ask a Stylist for the culturally acceptable dress code for any event. Or simply if you’re curious about the fashion rules of, say, wearing black with navy (or brown with black). Think of it as a library of fashion congress. Quick tips. Straight answers. Reach out to a Stitch Fix Stylist for advice now.